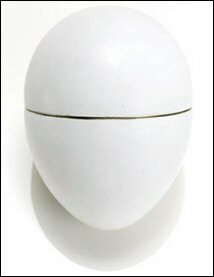 The gold shell of this simple but historic Egg is enameled opaque white and polished to resemble a hen's egg. 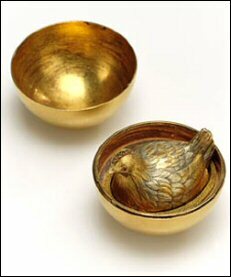 The two halves open to reveal a matt gold yolk, containing a varicolored gold hen with ruby eyes. 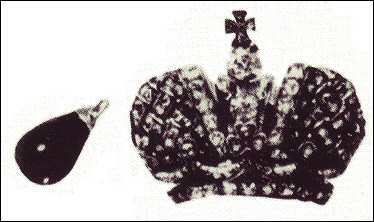 Originally contained within was a diamond replica of the imperial crown, which concealed a tiny ruby pendant. (see below). This Egg is a variation on an egg in the Danish Royal Collection, which Fabergé probably saw during his travels through Europe. 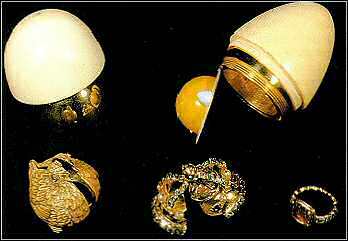 Whether is was Fabergé's or the Tsar's idea to create this Egg, Maria was deeply touched and a tradition started that would last for 30 years, until the Russian Revolution in 1917. The Easter Egg in the Royal Danish Collection. Made in the first half of the XVIII century. Inside the golden hen with diamond eyes, a diamond-set crown. Inside the crown a ring, also set with diamonds. 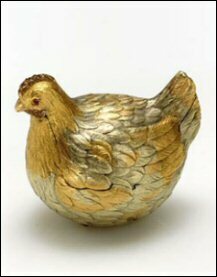 In the 1920's the First Hen Egg was sold by Russian officials to a dealer in Paris or Berlin. 1934 sold by Christie's (London) to Mr. Suenson-Taylor, later known as Lord Grantchester. In 1976 acquired by A La Vieille Russie, New York. 1978 sold in a private sale to Malcolm Forbes, The Forbes Magazine Collection, together with the Imperial Resurrection Egg. 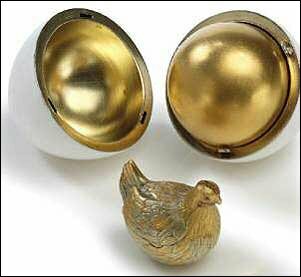 February 2004, sold by the Forbes family, together with 8 other Imperial Eggs and many other Fabergé works, to the The Link of Times Foundation, Russia. As there can only be one Imperial Easter Egg, I go for the provenance of the above described Egg and the words of Henry Bainbridge. Read more: http://www.treasuresofimperialrussia.com/e_chap1_hen.html - Link no longer active.